I thought it might be useful to round up some recent JISC-funded resources to support licensing decisions. The emphasis in these tools is on open licences because that’s what I’ve been most involved with, but I’d love to hear of other key resources to help people choose licenses. To get started, there is an overview of the openness of open licences which explores how open the various licenses are. This is part of the Strategic Content Alliance IPR Toolkit. Licensing open data: a practical guide is a thorough piece of advice about licences for open data of various kinds. This comes out of the UK Discovery work. The open bibliographic data guide is a really well structured resource to help libraries and content owners decide whether to make metadata available freely on the web under an open licence. It is from the UK Discovery work that JISC has been funding. The IPR and Licensing Learning Module from the Strategic Content Alliance allows you to work through the key concepts at your own pace. 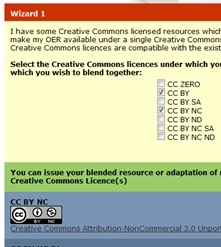 The Creative Commons compatibility wizards are interactive tools to help us understand what open licences can be remixed with each other. This is from the OER IPR support project suite of tools. You really need to understand what you can and can’t do with content licensed with the ND (Non-Derivatives) clause before you decide to use it, either as a provider or a user. The NC (Non Commercial) clause is the most highly debated clause at the point of release, this tool shows its implications, but we still need to understand better what it really means in the context of UK HE now and in the future. On a related note, the same tea, have also developed a Risk Management Calculator that helps you assess the risks of reusing existing works of different types in your work, depending on what you know about their licensing and how you want to license your work. The IPR for Educational Environments course is aimed at educators, covering all the basics you need to know about IPR. The MEDEV good practice and risk assessment toolkit steps you through decisions around copyright, consent and data protection. This seems like a good place to share some clarification following questions I’ve had in the past. Over three years ago JISC Collections developed an open educational licence to accompany their suite of licences . It was designed as a very open licence, to handle some of the complexities and lack of explicit permissions in relation to educational use of Creative Commons licences. For example, it was more specific about institutional liabilities which was important in the educational context. Since CC licences are now much better understood by publishers, such a licence is less necessary so we are not actively promoting it. Reflecting this growth in awareness of open licensing options, Jorum is now going to focus on openly licensed resources. Finally a plea: don’t forget that as well as deciding which licence to use, you also have to express it. The best way to do that is to embed it. Check out the guidance on embedding licences from the Strategic Content Alliance, and for images have a look at the Xpert Attribution tool. The growth in smart browser-based tools like Open Attribute is going to help end-users understand better what you are allowing them to do with your content, so think now about ensuring your carefully-chosen licence statement reaches your users. If you can’t quite see what you want in the list above, there are more resources and tools available through web2rights , The Strategic Content Alliance IPR Toolkit and of course, guidance is available from JISC Legal . The past few years has seen a step change in the adoption of such licenses, helped greatly by popular web services like Flickr, but we still have much to do in helping to raise awareness of the opportunities offered by open licenses, and to explore the business models around them. So there we have it: a round up of recent guidance, tools and courses funded via JISC to help you make sound licensing decisions. All developed with FE/HE in mind, but also useful to libraries, galleries, archives and museums, the creative sector and government.